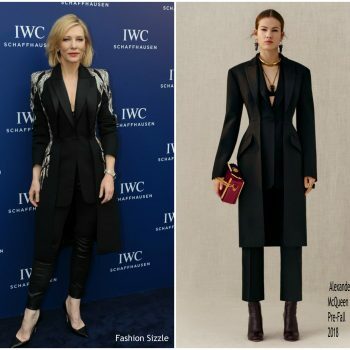 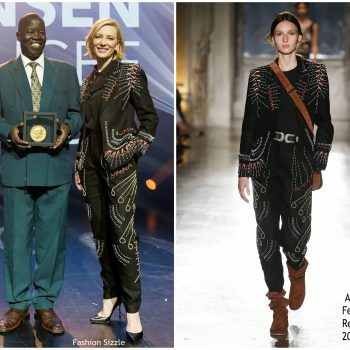 Cate Blanchett wore an Alexander McQueen Pre-Fall 2018 customized ensemble to a IWC Schaffhausen event in Shanghai, China last week. 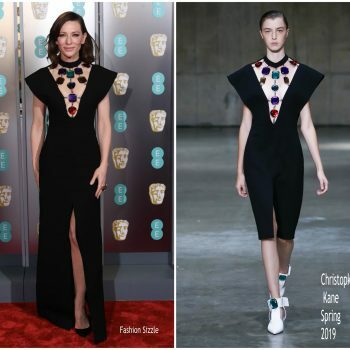 Cate Blanchett and the 2018 British Academy Britannia Awards! 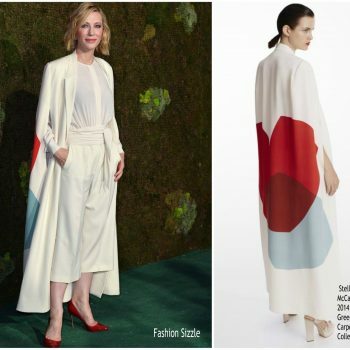 the annual award ceremony on Friday night (October 26) at The Beverly Hilton Hotel in Beverly Hills, Calif. She is wearing a Givenchy Spring 2019 gown. 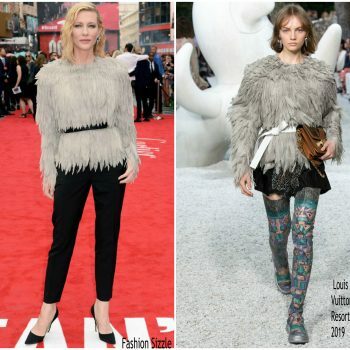 Cate Blanchett attended ‘The House With A Clock In Its Walls’ Rome Film Festival premiere this evening (October 19). 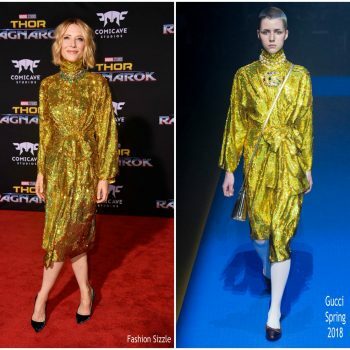 She wore a custom Maison Margiela Spring 2018 Haute Couture gown by John Galliano. 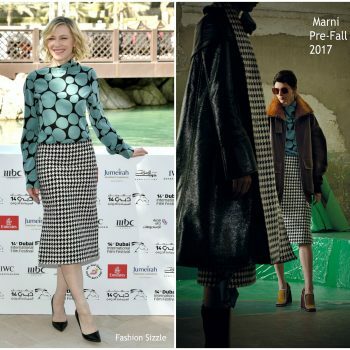 Cate Blanchett was in attendance at the Rome Film Festival photocall of ‘The House With A Clock In Its Walls’ this afternoon (October 19) Italy She is wearing an Acne Studios Spring 2019 design. 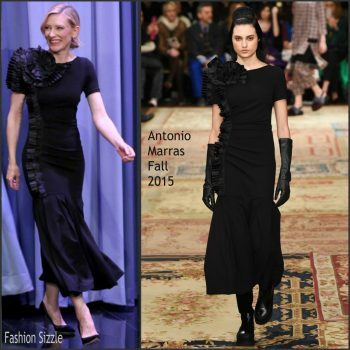 Cate Blanchett attended the Pomellato Balera Party Event on Saturday (September 22) in Milan, Italy. 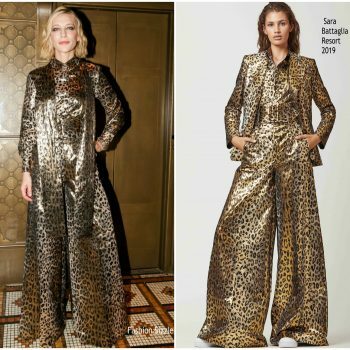 She wore a metallic leopard-print Sara Battaglia Resort 2019 jumpsuit. 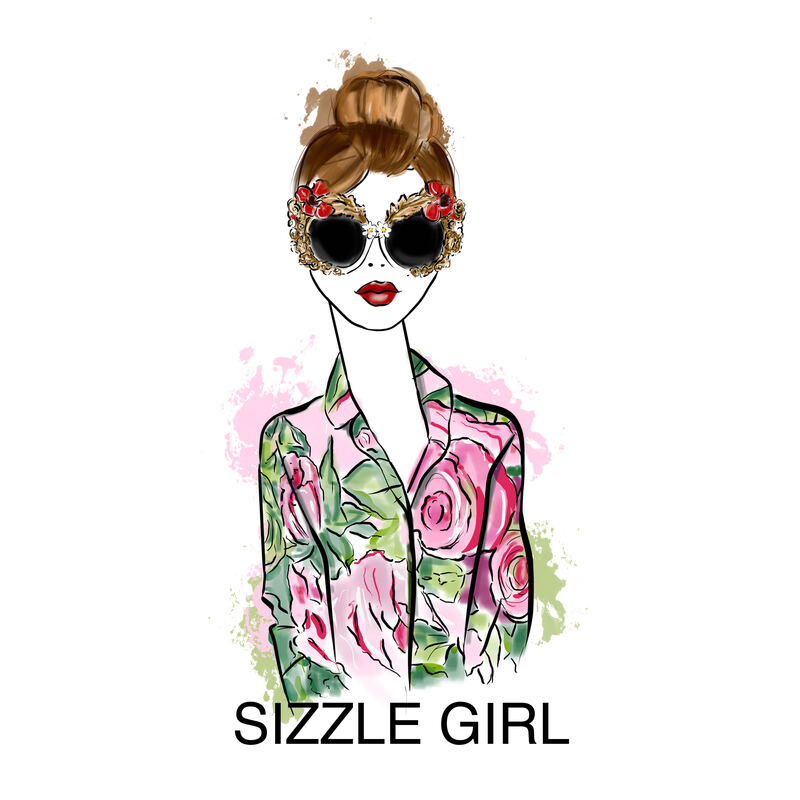 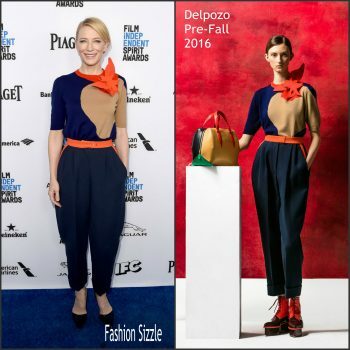 Her look was completed with Pomellato jewelry. 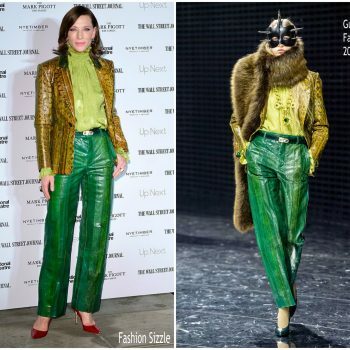 Cate Blanchett was in attendance at the Green Carpet Fashion Awards on Sunday (September 23) in Milan, Italy . 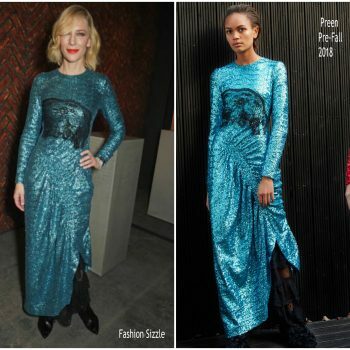 She wore a Stella McCartney’s 2014 Green Carpet Collection. 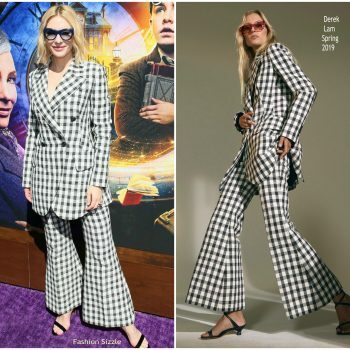 Cate Blanchett attended the London world premiere of ‘The House With The Clock In Its Walls’ on Wednesday (September 05). 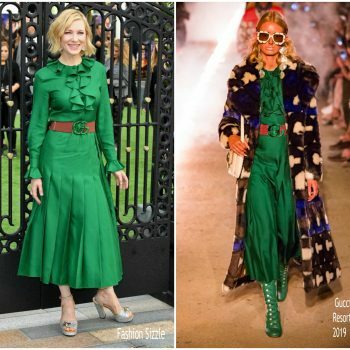 She wore a green ruffle Gucci Resort 2019 belted dress and bee-detailed heels. 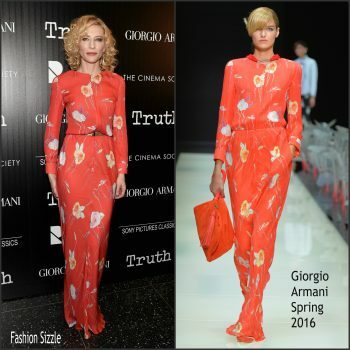 Cate Blanchett was in attendance at the Suspiria premiere during the 2018 Venice Film Festival. 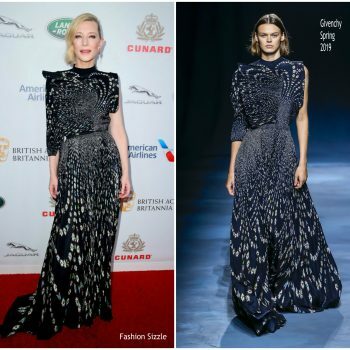 She wore an Armani Prive Fall 2018 Haute Couture asymmetric gown. 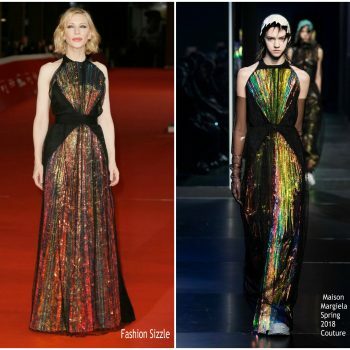 Cate Blanchett attended the ‘A Star Is Born’, Venice Film Festival premiere on (August 31)She wore a Armani Prive Fall 2018 gown. 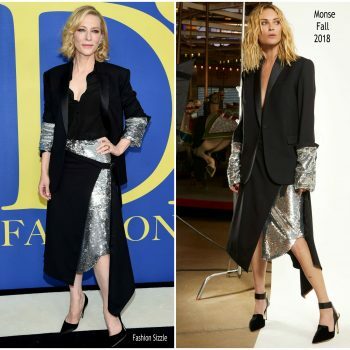 Cate Blanchett attended the 2018 CFDA Fashion Awards on Monday (June 4) at the Brooklyn Museum in New York City. 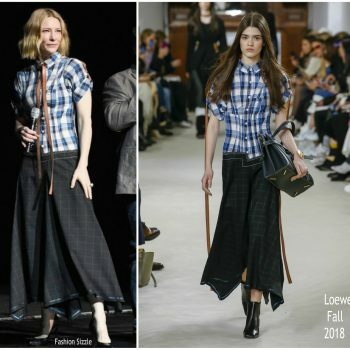 She wore a Monse Fall 2018 design. 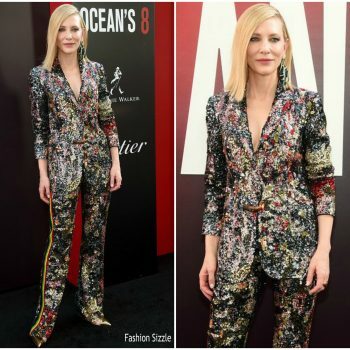 Cate Blanchett attended the “Ocean’s 8” worldwide photo call at The Metropolitan Museum of Art in New York City. 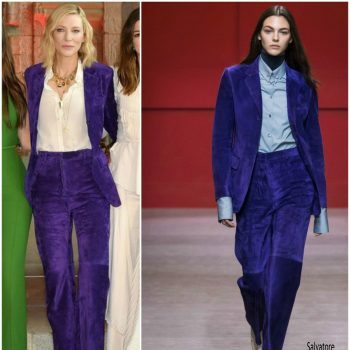 She wore a Salvatore Ferrgamo Fall 2018 purple suede suit. 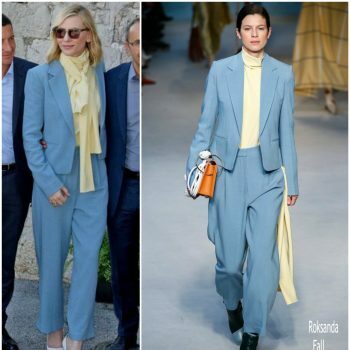 Cate Blanchett Fall 2018 blue suit & yellow blouse to the jury lunch during the 2018 She wore a blue Roksanda Fall 2018 suit styled with yellow pussybow blouse. 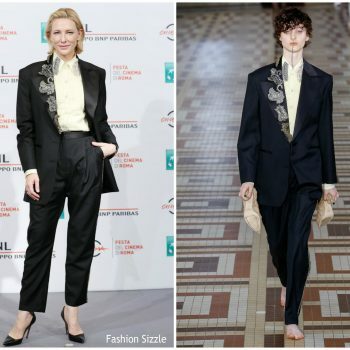 Cate Blanchett was in attendance at the premiere of ‘Capharnaum’ held during Cannes Film Festival this evening (May 17). 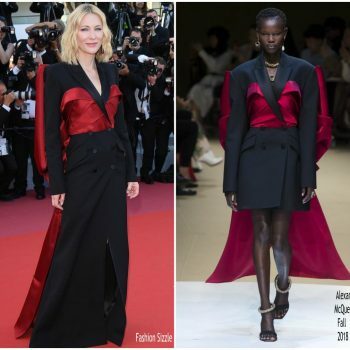 She wore a strapless black Givenchy Spring 2018 Couture design. 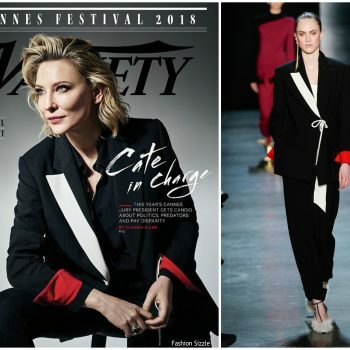 Cate Blanchett attended the ‘Cold War (Zimna Wojna)’ Cannes Film Festivalpremiere on Thursday (May 10) in France. 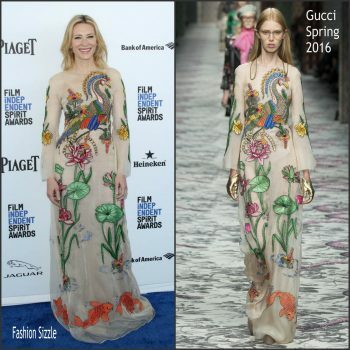 She wore a custom halter Mary Katrantzou Spring 2018 printed hi-lo gown design. 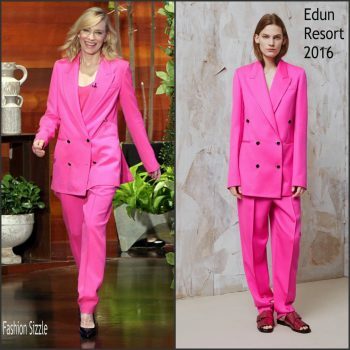 Cate Blanchett attended the 2018 Cannes Film Festival Jury Photocall She is wearing a pale pink Stella McCartney suit styled with a pair of Aquazzura Eclipse pumps. 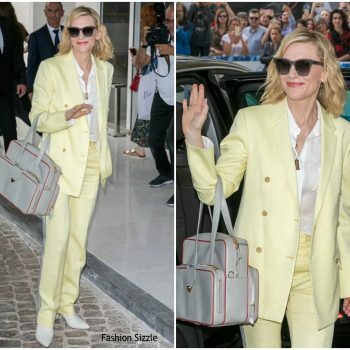 Cate Blanchett was spotted arriving at the airport on Sunday (May 6) just ahead of the 2018 Cannes Film Festival in Nice, France. 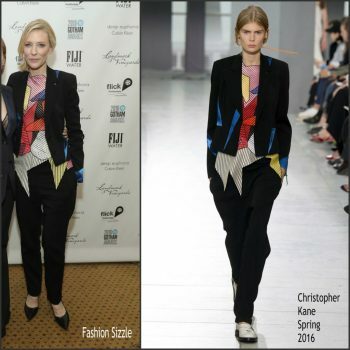 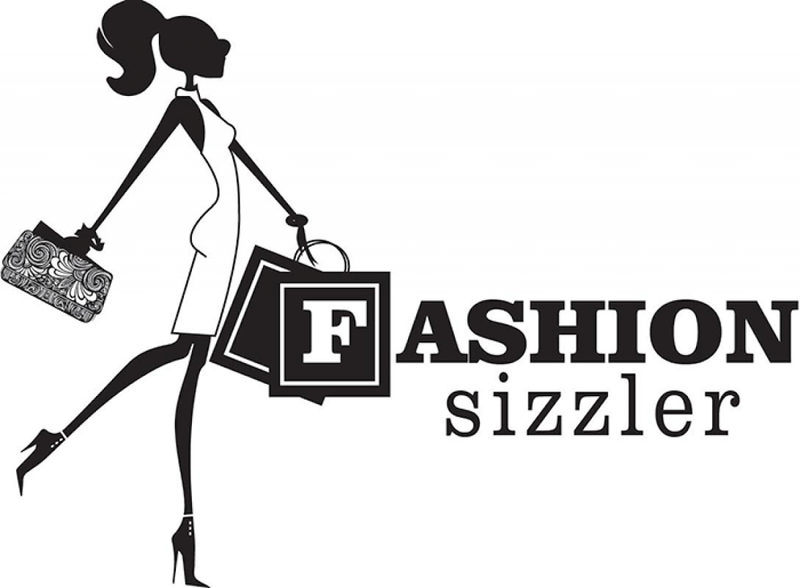 She is wearing a grey tweed two-piece suit styled with a black blouse . 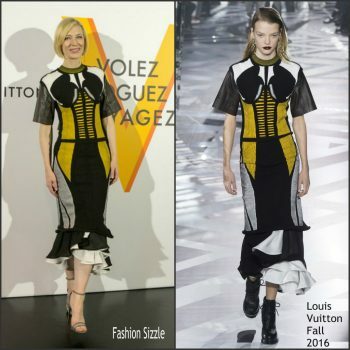 Cate Blanchett attended the 2017 Dubai International Film Festival She us wearing Louis Vuitton Resort 2018 design. 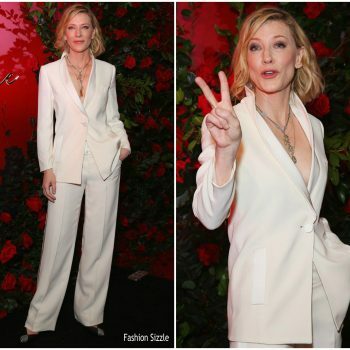 Cate Blanchett was in attendance at the London Evening Standard Theatre Awards on Sunday (December 3). 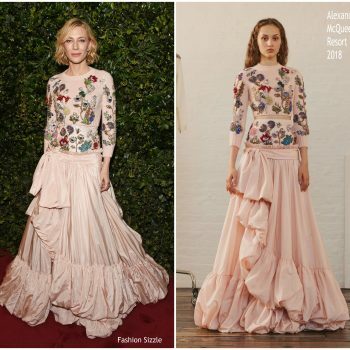 She wore an Alexander McQueen Resort 2018 gown. 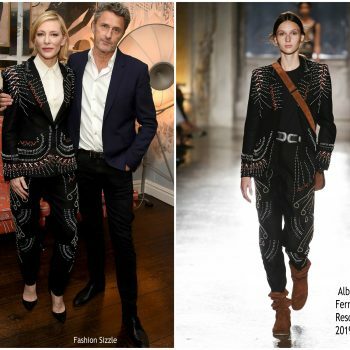 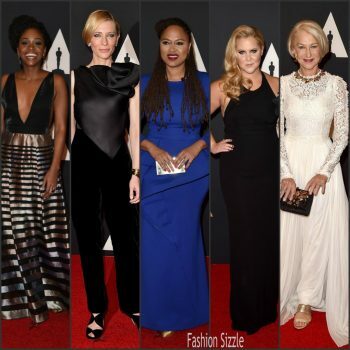 Cate Blanchett attended the 3rd Annual InStyle Awards on Monday (October 23) in Los Angeles, California. 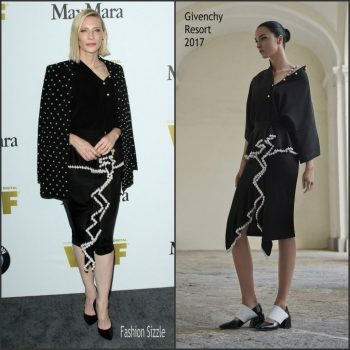 She wore a Givenchy Spring 2018 dress styled with red and black pumps. 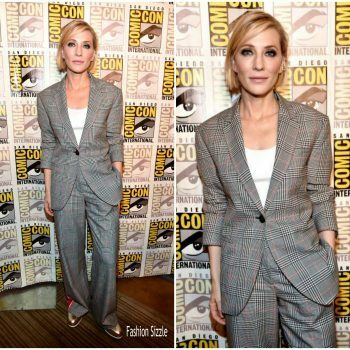 Cate Blanchett attend the "Marvel" panel on day 3 of Comic-Con International on Saturday, July 22, 2017, in San Diego . 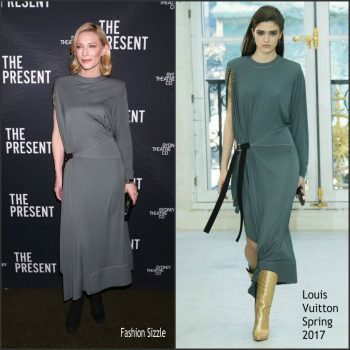 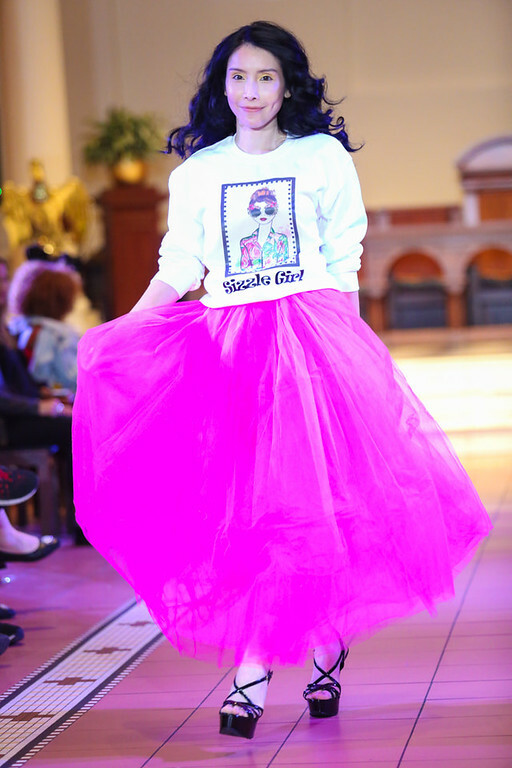 She wore a Monse design. 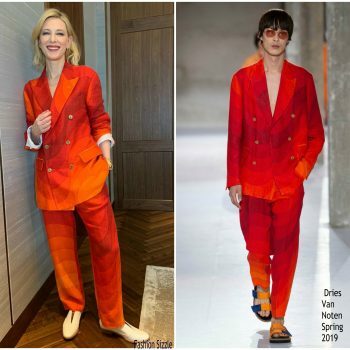 Cate Blanchett was in attendance at the premiere of ‘Manifesto’ during the 2017 Tribeca Film Festival on Wednesday (April 26) in New York City. 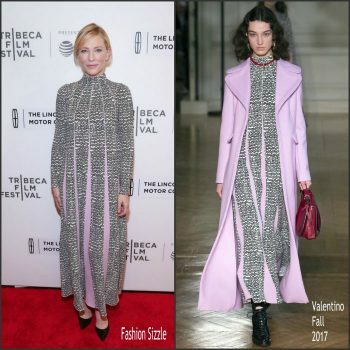 She wore a Valentino Fall 2017 design. 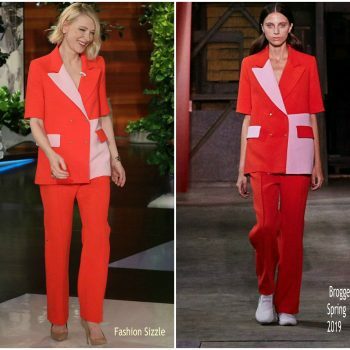 Cate Blanchett made a guest appearance on ‘The Tonight Show Starring Jimmy Fallon’ on Monday (January 23) in New York City. 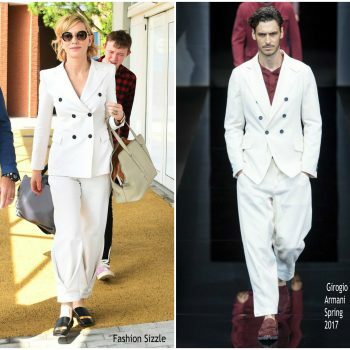 She wore a white and black Givenchy Spring 2017 suit. 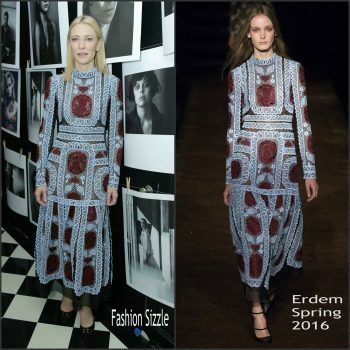 Cate Blanchett attended the Pedro Almodovar Retrospective Opening Night at the Museum of Modern Art on November 29, 2016 in New York City. 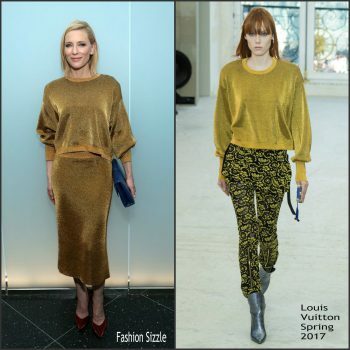 She wore a Louis Vuitton Spring 2017 loose sweater and pencil skirt. 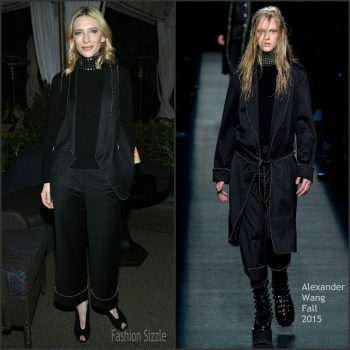 Cate Blanchett attended The Opening of Louis Vuitton Volez Voguez Voyagez Exhibit in Tokyo. 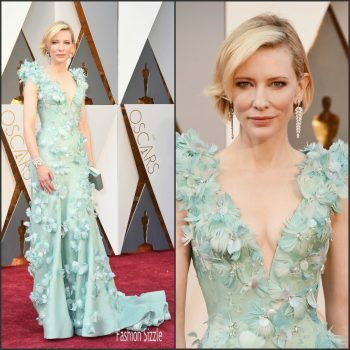 Cate Blanchett attended EE British Academy Film Awards at the Royal Opera House on February 14, 2016 in London, England. 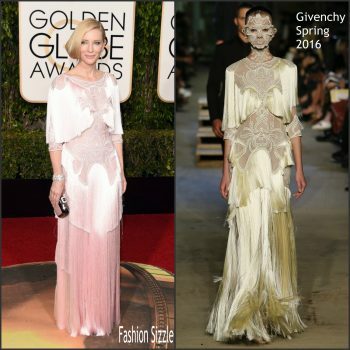 She wore a custom Alexander McQueen Spring 2016 gown.